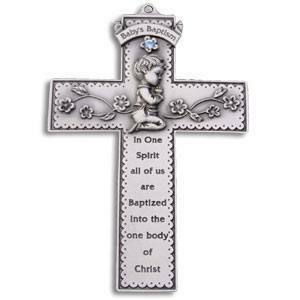 This baptismal cross is a great gift idea for a Catholic baby boy's baptism. Finely crafted from pewter, this cross features a praying boy beneath a banner reading "Baby's Baptism." The inscription below the boy reads, "In One Spirit all of us are Baptized into the one body of Christ." Also, above the boy is a blue stone which adds a classy splash of color to the cross. This baptismal cross is a perfect gift idea for a Catholic baby boy's baptism!